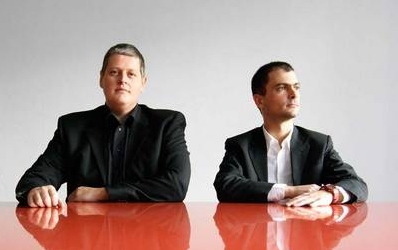 Fabio Gramazio (1970) and Matthias Kohler (1968) are architects with multi-disciplinary interests ranging from computational design and robotic fabrication to material innovation. In 2000, they founded the architecture practice Gramazio & Kohler where numerous award-wining designs have been realised. Their built work includes such notable pieces as the robotically built facade of the Gantenbein vineyard, the Christmas lights for the Bahnhofstrasse in Zurich, the sWISH* Pavilion at the Swiss National Exposition Expo.02 and the House Riedikon. Fabio Gramazio and Matthias Kohler are also professors for architecture and digital fabrication. In 2005, they founded the world’s first architectural robotic laboratory at the Swiss Federal Institute of Technology in Zurich where their pioneering research concentrates on a multi-disciplinary practice between computational design, robotic fabrication and material innovation. This ranges from 1:1 prototypical installations to the design of robotically fabricated highrise buildings. Gramazio & Kohler were awarded the Swiss Art Awards, the Global Holcim Innovation Prize and the Acadia Award for Emerging Digital Practice. Their work has been published in a large number of academic journals, further contributing to numerous exhibitions around the world such as the Architectural Biennale in Venice (2008) or the Storefront Gallery for Art and Architecture (2009) in New York.